ISLAMABAD, June 2 (APP): Concluding session marking culmination of PAF’s exercise Tempest-II was held at Air Headquarters here on Thursday. According to a press release, Chairman Joint Chiefs of Staff Committee (CJCSC) General Rashad Mahmood, was chief guest. 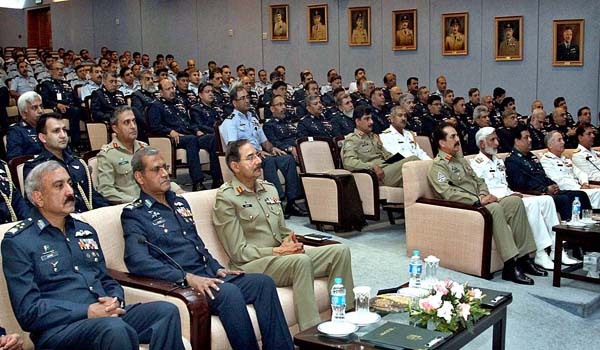 Chief of the Army Staff, General Raheel Sharif, Chief of the Naval Staff, Admiral Zakaullah and Chief of Air Staff Air Chief Marshal Sohail Aman were also present at the session. Senior officers from tri-services also attended the session. sister services, has played an important role in the ongoing operation Zarb-e-Azb. CJCSC lauded the efforts of conducting this significant war game which will help in revolutionizing the latest war fighting concepts. He said the exercise not only generated fruitful debates on strategy and planning but also proved to be an effective tool in identifying own strengths and challenges. The war game was based on the prevalent Concept of Operations of PAF and it helped in assessing the efficacy of Airpower in any future conflict. This exercise would prove to be an important element of the PAF’s operational planning cycle and its outcome would assist PAF in campaign planning during war.